This one is on its way to a friend. All Natural, Rough Out, with white stitching. Nice touch John. I like it. John at is absolutely awsome. May I ask how do you keep the leather so clean. When ever I make a holster before I dye it there is always some crap that gets on it eith from my hands or the glue or from my bench. Is there a secrete I am missing? I rarely do a project like this, for the exact reason that you mentioned. Luckily, I have a sink in the shop - soap is your friend . I also have a special table just for natural leather, and I clean it religously to keep every spec of grime/dust/whatever off of it. For everything else, I dye first (it also cuts easier when it is a bit moist from the dye). I have never been able to get an even finish by dying after. Some really notable greats can (Matt Del Fatti), but not me. ok that makes perfect sense. I agree about dying. Any other color then black is a real pain. I still havn't found a tan that I can do evenly. I do dye after its finished only because I find molding to be a bear with dyed leather so I dye first and mold last. Nicely (and I bet VERY carefully) made! Thanks Matt! Yes indeed - I didn't work on anything else until it was finished and out of the shop. I must have washed my hands 20 times during the day. 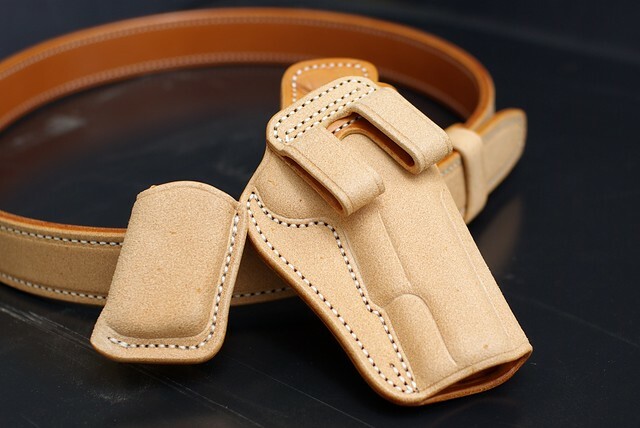 I have never been a fan of the natural leather gear but either one of those could change my opinion real quick Outstanding work John, I remember when you were selling holster on other forums and its amazing the progress toward being an artist you have made, truly amazing. And this eternal resting place Is known as Fiddlers' Green. INCREDIBLE! I can't stop looking at these rigs. I'm not only amazed at how clean they turned out (like a couple of others), but the attention to detail--not just what I'd call perfect stitching, but even the crease lines on the holster loops, belt keeper, and top edge of the mag pouches. Absolutely stunning. Thanks for the compliment. That was one of the toughest projects I have worked on, and I was thrilled (and relieved) that is turned out so well. Ok, looks like I may have to call you soon.....this is gorgeous!!!! I need a couple of new belts anyway, might as well make it holsters too. Don't you just love nature!